Today is the first day in four and the last day in ten with a daytime high temperature in the Twin Cities above 20°F. 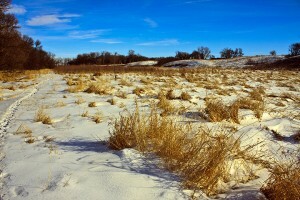 On January 25 the daytime high temperature was 24°F. According to the Web site Weather.com it will snow tomorrow then get cold and stay cold for the next ten days. Beyond that Weather.com does not have a prediction. If I want to get outdoors, today is the day. I do, and I did. 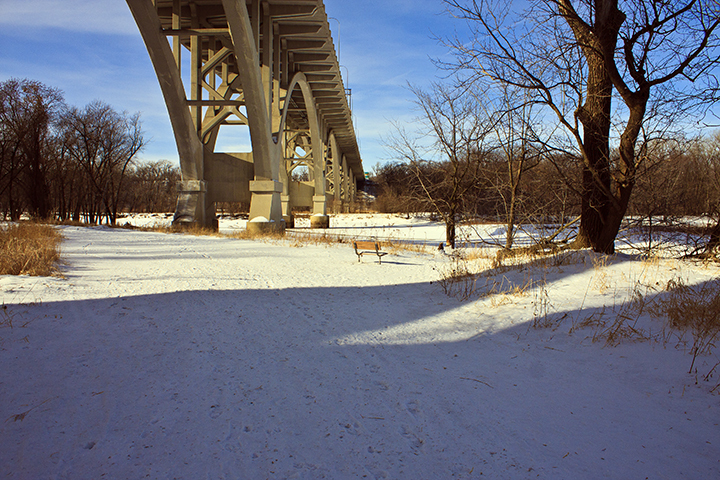 A thin layer of cirrus clouds filtered the sun when I arrived at Fort Snelling State Park a little after noon. I went into the park office to get a map and talk to the park ranger on duty. 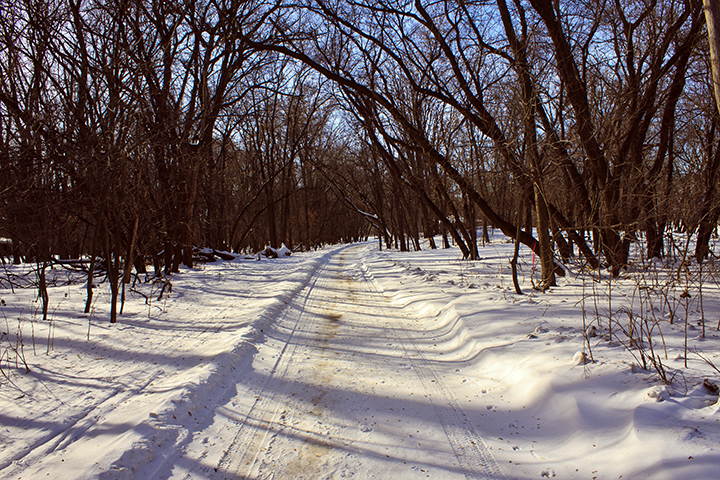 The woman behind the counter said that the trails were groomed and snowshoes were not necessary. She also said that on Pike Island the inner trails were open but the outer trails, those nearest the Minnesota River, were closed. 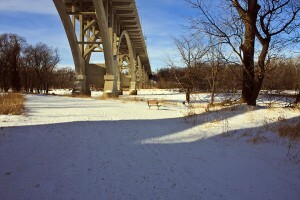 The best place to photograph the river would be Picnic Island. That is where I headed next. 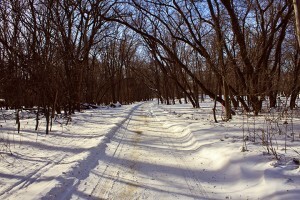 I parked in the northernmost lot on Picnic Island, turned on my Garmin GPS, and headed north to the New Hope Trail. No, I was not afraid of getting lost in this small suburban oasis. I keep a GPX track of every hike. 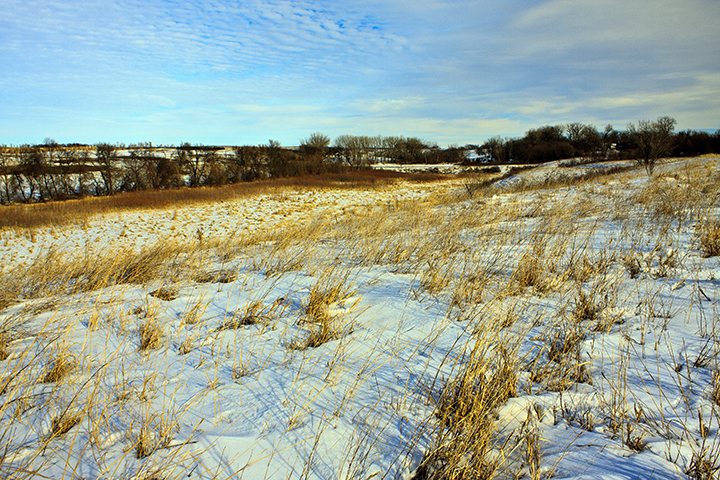 The trails are well packed with just two to three inches of loose snow on top. 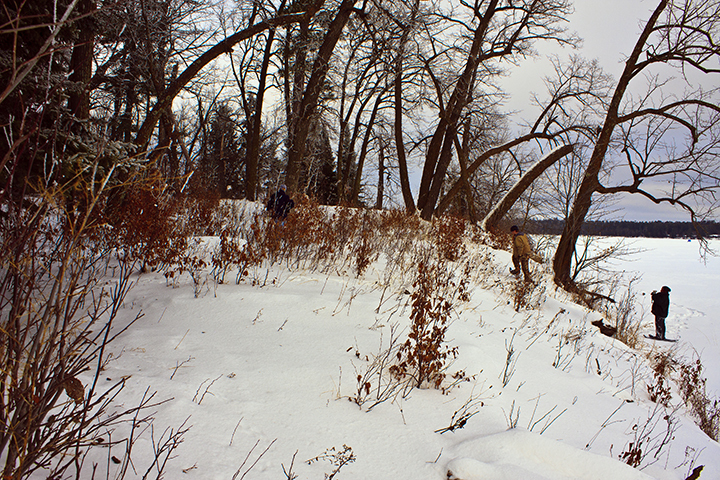 I left the trail and approached the picnic shelter near the west end of the island. Two Wild Turkeys emerged from the woods about 100 yards to the west. 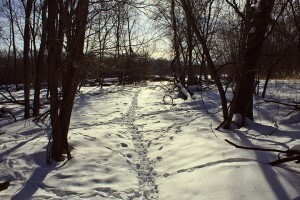 I stopped and watched as a long line of ten turkeys slowly walked from the woods to the frozen river. The lead turkey had a waddle that swung from its neck almost to the ground. Less than a minute after the last turkey cleared the woods three whitetail deer emerged at the same spot. They looked around then took the same path as the turkeys to the river. They were followed closely by a group of six more deer. When the last of the deer was out of site I started back to the trail, not wanting to spook the wildlife. I needn’t have worried about spooking the deer. Fifteen minutes leaving the picnic shelter area I passed another small group of whitetail deer in the woods not more than 20 feet northeast of the trail. Three were standing and watching me closely, two were lying down and ignoring me. Not wanting to spook them I did not slow my pace and I looked at them mostly with my peripheral vision. After my hike on my way out of the park, just west of the park office, I saw another large group of Wild Turkeys. There were at least 25 turkeys in the woods just north of the park drive. This entry was posted in Trips on January 29, 2014 by John Valo. 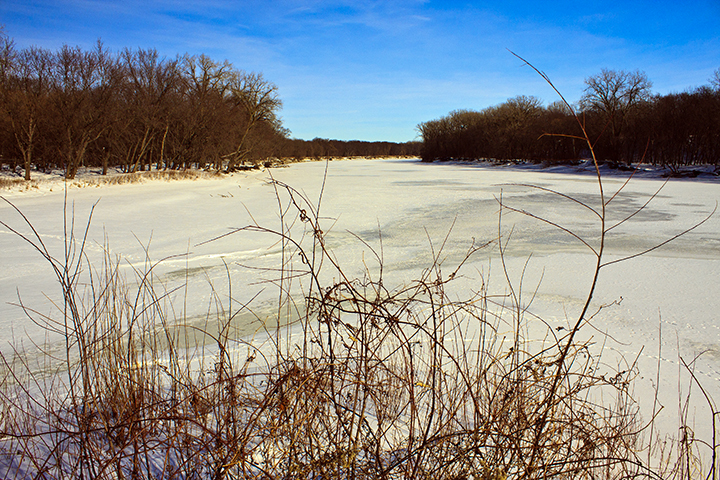 The warm spell between the polar vortex and its little brother provided an opportunity for another visit to Des Moines River SNA. For the first time in 16 months the snow here is deep enough and firm enough to snowshoe. Christianna Bridge Public Water Access, the unofficial parking area for this site, is a popular destination year round, especially on weekends. 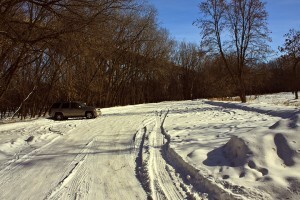 When I pulled into the snow-covered parking lot there was a Pickup with a very long snowmobile trailer already there. While I strapped on snowshoe s I was greeted (scolded?) by the screech of a Red-tailed Hawk. This may be the same hawk, the only hawk, that I see every time I visit Des Moines River SNA. 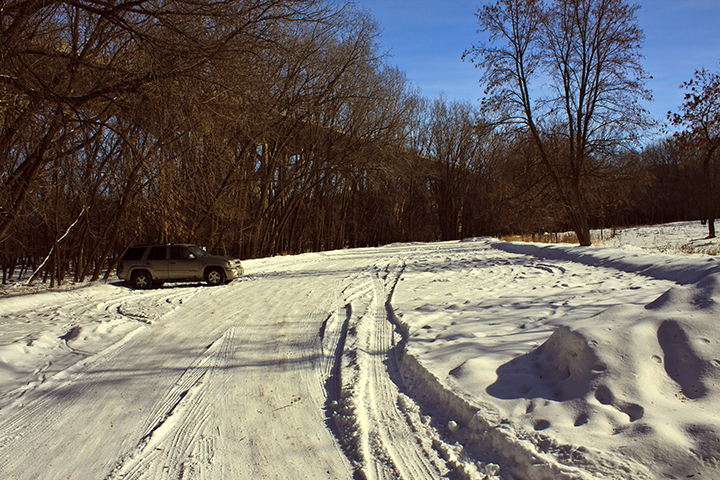 As I headed up the bluff to the SNA four more pickup trucks, two towing ATVs and snowmobiles, pulled into the parking lot. I turned north. A small herd of 11 whitetail deer were in the wooded area adjacent to the intermittent stream just north of the parking area. When they saw me they ran, apparently heading for the larger woods to the north. 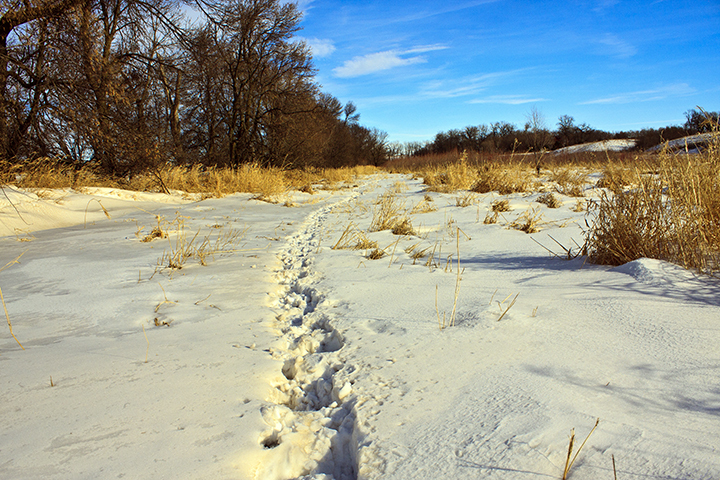 Snow is firmly packed over well-travelled deer trails. On this day it was often firm enough to support my weight. 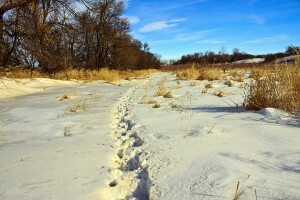 Where practical I followed deer trails. 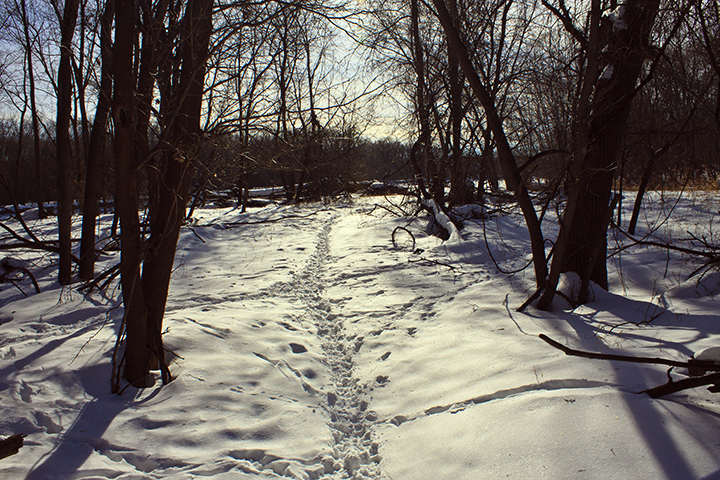 Many of the trails were fresh. 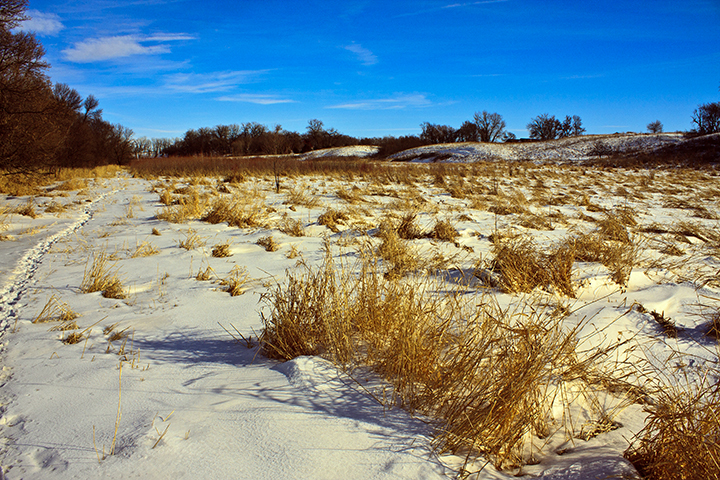 Others were completely buried by the recent snow and appeared as narrow strips with slightly less grass protruding from the snow. 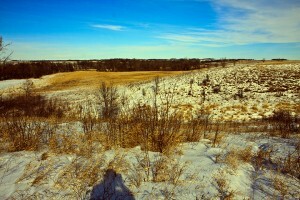 I avoided most of the wooded area and turned west when I reached northern boundary. 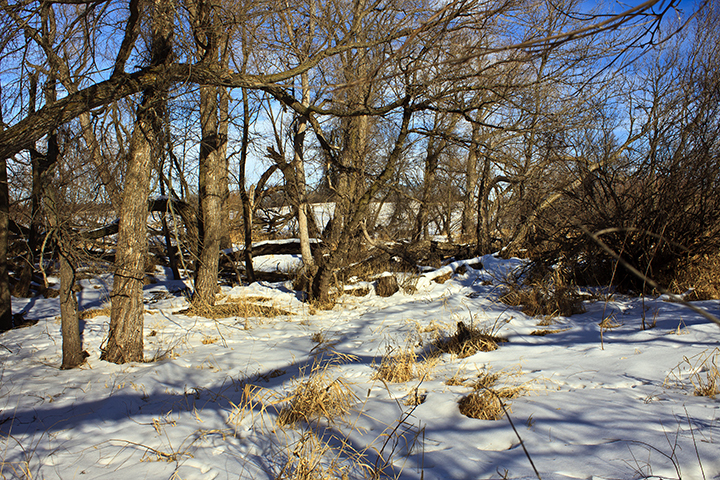 A fire break was cut through the willows along the north boundary making travel through this section much easier. As I followed the fire break Ring-necked Pheasants were flushed in groups of mostly 2 or 3. Between the woods on the west and County Road 79 at the eastern boundary I (inadvertently) flushed at least 25 pheasants, possibly as many as 40. I was careful not to double count any birds. 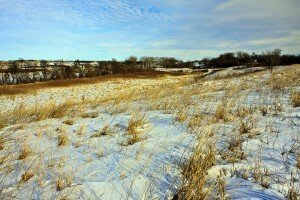 I turned south at the “mother of all deer blinds”, a large, four-walled platform atop a 25′ high, 18″ in diameter pole. I followed the east boundary until I got to “Mirabilis Way”, a narrow strip of land leading ¼ mile to the SNA’s official parking spot on the shoulder of County Road 79. I gave the corridor that name because it is densely choked for almost its entire length with white sweet clover and yellow sweet clover. I turned east here following an old roadbed as far as it went. I crossed the intermittent stream, turned southwest, and headed back to the parking area. This was a short trip, 3¼ hours but only 3.3 miles. 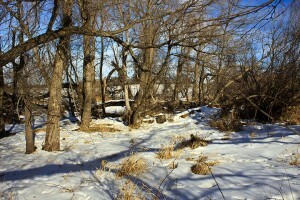 This entry was posted in Trips on January 19, 2014 by John Valo. 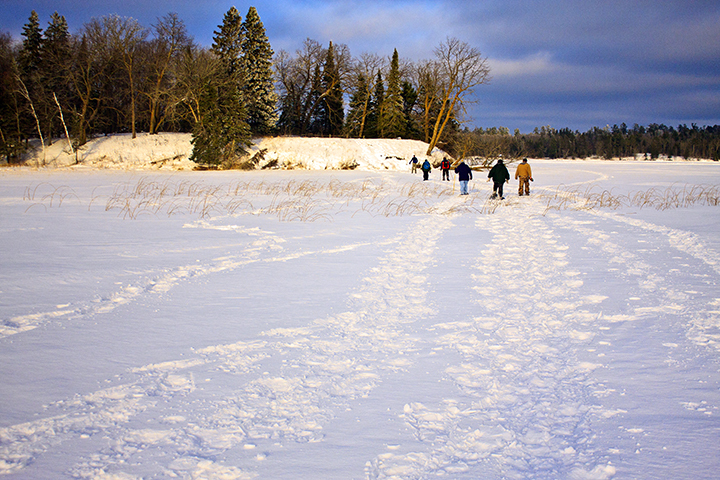 The Minnesota DNR hosted the annual Potluck for the Scientific and Natural Area site stewards at Itasca State Park. Though scheduled well in advance they could not have chosen a better weather day. Following the frigid subzero temperatures of the polar vortex this was the first day of the new year that saw daytime temperatures climb above 20°F. Attendance seemed to be up over 2013 despite roads that were slick in some areas. It was fun meeting other site stewards and sharing impressions of their SNAs. After two hours of socializing we broke into groups and headed out to visit SNAs. Two groups went to the La Salle Lake SNA. 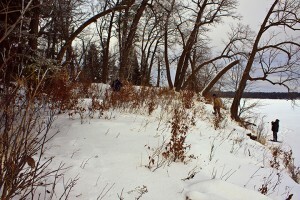 One group went to the densely wooded section east of the Mississippi River. The second group went to the bluff south of the river where there is a spectacular overlook with a view of the Mississippi River valley. The third group included Peggy Booth, DNR Scientific & Natural Areas Program supervisor, and was led by Kelly Randall, DNR SNA outreach coordinator. Kelly and Peggy were on skis, the rest of us on snowshoes. We skied/snowshoed to the Itasca Wilderness Sanctuary SNA. This entry was posted in Trips on January 11, 2014 by John Valo.